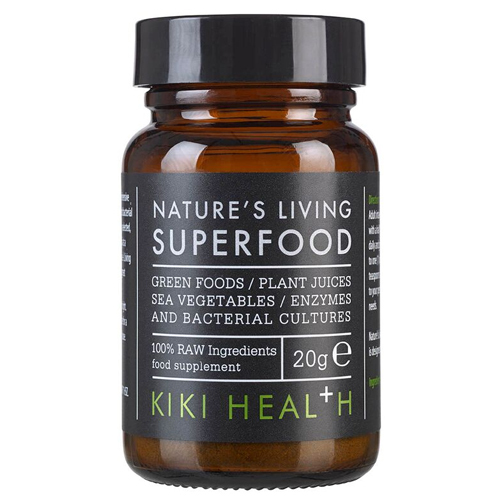 KIKI Health Organic Nature`s Living Superfood is a green alkalising whole food supplement. It is derived from a comprehensive blend of raw whole foods, including alkalising land and sea vegetables, micro-algae, enzymes and bacterial cultures. Eat your fruits and vegetables is one of the most tried and true recommendations for a healthy diet. In today`s hectic lifestyle, it is sometimes a challenge to consume enough nutrient-dense, fresh foods. Nature`s Living Superfood is designed to support your daily nutritional needs as it is made exclusively from plant-based, whole food ingredients with probiotics and enzymes, all of which assist in allowing the body to absorb the nutrients it needs and support digestive health. Nature`s Living Superfood is made from 100% raw ingredients. All 34, cold pressed, primary ingredients in Nature`s Living Superfood have been carefully selected, balanced and prepared to ensure maximum absorption and utilization in the body at a cellular level. The complex blend of raw green foods and plant juices makes Nature`s Living Superfood the perfect addition to your favourite smoothie or juice. It also tastes great sprinkled on salads. Land Vegetables: Nettle Leaf, Wheatgrass Leaf, Barley Grass Leaf, Shavegrass (Horsetail), Alfalfa Grass Juice, Carob Pod, Burdock Root, Ginger Root, Nopal Cactus, Barley Grass Juice, Oat Grass Juice, Dandelion Leaf, Kale Leaf, Parsley Leaf, Cabbage Leaf, Broccoli, Amla Berry. Enzymes: Protease, Amylase, Lipase, Cellulase, Bromelain, Papain, Alpha Galactosidase. Bacterial Cultures: Lactobacillus Plantarum, Lactobacillus Paracasei, Lactobacillus Rhamnosus, Lactobacillus Salivarius, Streptococcus Thermophilus, Lactobacillus Bulgaricus. Directions for use: Adults intake should begin with ½ teaspoon daily and gradually increase to 1 or more heaped teaspoons according to your lifestyle. Nature`s Living Superfood can be consumed mixed with juice or pure water. Alternatively it can be sprinkled or mixed with food. Nature`s Living Superfood is packed in amber glass for optimum nutritional preservation, freshness and purity. Ingredients may be juiced or blended. 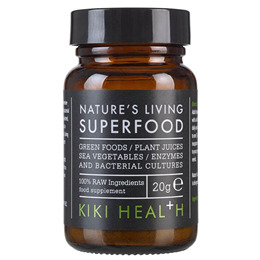 Below are reviews of KIKI Health Nature`s Living Superfood - 20g Powder by bodykind customers. If you have tried this product we'd love to hear what you think so please leave a review.